At 23 weeks pregnant, you should be thinking a little beyond the pregnancy radar such as your finances. While adding the finishing touches to your nursery and selecting between cloth diapers and disposables is important, this is the right time to give your health insurance company a call to check up on what’s covered under your current plan, and if there are any adjustments to make. Further and if you haven’t done so already, there’s no better time than now to open up a baby’s savings account, because costs of raising a little munchkin until they are 18 years old can spiral out of control, and in terms of numbers is a little over $225,000 per year! While you might have bid goodbye to most of the harsh symptoms of the first trimester such as fatigue and nausea, the ones you experience starting week22 and when you’re 23 weeks pregnant could cause discomfort. Without further ado, let’s get right to the common symptoms you may experience in week 23. The sensation of your belly getting super tight may feel weird, but it is due to your muscles working out to prepare for labor. Although these contractions should vanish rather quickly, you can speed up the process by drinking lots of water, and switch positions often to stay comfortable. A little puffiness is completely normal, and you can get great relief by walking regularly, stretching your feet and putting them up as much as you can and drinking lots of water. Preeclampsia a dangerous pregnancy condition causes extreme or sudden swelling, so contact your doctor immediately if this is the case. Bet you never thought that your pregnancy could affect your mouth, but it does happen and is mostly caused due to the raging hormones and consequently increased blood flow. If your mouth and gums feel more sensitive than usual, try brushing with asoft bristle toothbrush, and floss with care. Adding to this, visit your dentist regularly, who may want to order some extra tests, which will exclude x-rays since they aren’t recommended for pregnant women. This pregnancy symptom is mostly caused due to your growing baby. It is common to women who are 23 weeks pregnant with twins owing to them bending your spine and stressing your back muscles. Your fundal height (measurement from the pubic bone to top of uterus) when you’re 23 weeks is between 21 to 24 centimeters. You have by this time gained between 12 to 15lbs and roughly 23lbs so far if you’re are pregnant with twins. This may sound like a lot, but by gaining the recommended amount of weight, you will greatly reduce the chances of preterm labor. At 23 weeks, you can probably feel your baby’s movements, and they may follow the same wiggling routine when they make their grand entry into the real world, so take notes! 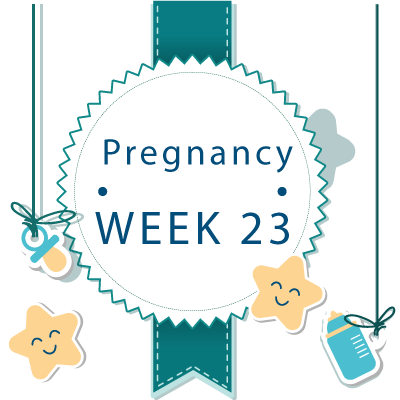 23rd Week Pregnant Ultrasound - What to Expect ? 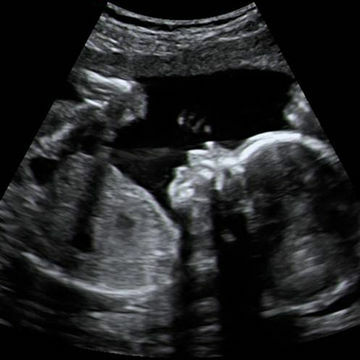 If you had a 23 week ultrasound, it would reveal a well formed baby that continues to grow. Since your OB schedule is now once a month, you may not have a 23 week ultrasound and you’re hopefully done with all the generic testing. You will however be busy with doctor’s appointments in your third trimester and may see your OB every other week, so use this time to check off a few things from your to-do list. Your bowels when you’re week 23 may not be normal, but rest assured your baby is enjoying a regular routine—more active at night and quieter during the day. All your baby’s internal systems are set in the right places, but a little more time is needed for them to mature completely. Furthermore, their area in the brain responsible for sensing movements known as the vestibular system is one of the first parts of the brain to mature and is already in the process of sensing all your movements. Simultaneously, your baby’s hearing capabilities continue to develop and sharpen, and studies indicate that babies who are exposed to loud sounds when in the womb such as a lawn mower are less likely to be startled by them when they arrive in the real world. 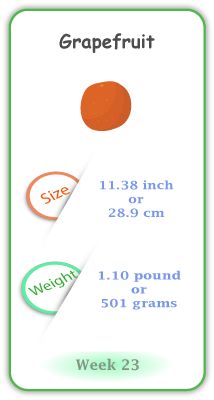 Your baby when you’re 23 weeks measures approximately 11.38 inches and weighs 1.10 pounds, a significant change from week22.